Being a diver is great. If you are the certificate dive master, your services can be used by various people who are loving the underwater or aquamarine life. But even if you are just a hobbyist and simply love the way of snorkeling, everyone of us still have the responsible to take care the future of the coral reefs, the sea and all the underwater life. Diving and snorkeling can harm the sea if you are doing it wrong. Your dive master can also be wrong in some parts of the job when guiding you under. So that, I’d like to give you some of the things that can be as the guide to be the responsible diver and snorkeler. Enjoying the marine life without leave traces that can destroy the life. What you can do to be the responsible diver and snorkeler? Un-decomposed wastes such as plastic, the cans, glass bottles and many more are proven to be the dangerous to the environment either on the land or even into the sea. They are contributing in damaging the corals and also the fishes or any other sea species. If you are the diver or snorkeler, then you MUST to stay away of those. If you are traveller that interesting to experience the snorkeling or diving activity, you can choose the tour operator that is applying the sustainability principles. They should have introduced you about the environment and the ecosystem you are going to visit. Your guide should also inform you about the prohibition to touch or stepping on the reefs and the sea animals. 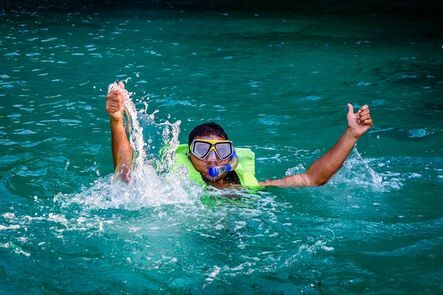 If you have been arrived at the snorkeling or diving spot, make sure to know that your entry point to the water is clear so you can consider whether the sea is deep or shallow. Some of the people may rush into the water by jumping into it. It is feared that when they are jump, their body will be crash the coral reefs. The corals will be break and so with the body, you can be wounded. Make sure to keep your position as parallel (horizontal) as possible with the water when close or even above the reef. Ideally, you are at least 50 cm from the bottom of the substrate. You have to keep the safe distance between you with the coral or sea animals that you might encounter. So with the fins to avoid the unintentionally contact. If you are exhaustion, never stand up or taking rest below the bottom of the sea or holding onto the reefs. Never try to chase and ride the sea animals. They will be disturbed by that. Simply enjoying the underwater view and never try to do something that will make the sea animals in stress. Never take anything from the sea but the salt water on your body. You can also try not to buy souvenirs made out of the sea animals or something like that. For the operator guide, make sure that there will be the trash can on the boat for the travellers or tourists. That’s all I some of the valuable things I can give you for now to be the responsible diver and snorkeler. Keep on remember that if you are enjoyed the underwater life, then you and everyone of us have no reasons and rights to leaves it in damage. Previous postGet the Best Bali Luxury Villas Seminyak Offers Here!